Ran into a bit of a weird issue the other day. Suddenly non of my vApps could be started and all I got back was the following errors: “Batch update returned unexpected row count from update ; actual row count: 0; expected: 1” (See screenshot). Some google searches didn’t give any results related to VMware, only a few pointing at databases and hibernation modes????? Well, that is a very clear message :-) And indeed when checking the OrgVDC I could see that it was near its limit of GHz I set. I shutdown some other vApps and could now power on the vApp I was testing with. Update: The error occurred on multiple occasions. I also had this happen when deploying a vApp with a number of static routes between the vApp Networks. In those static routes an IP address was used pointing to an IP from a static pool, which means that with each boot of the vApp, that IP could potentially change and that is what triggers the error. I could easily solve this by editing the static routes to point to the default gateway (edge) and re-edit the static route after a new deployment. During restarts of the vApps the IP will not change because I enabled the option “Retain IP / Mac resources”. 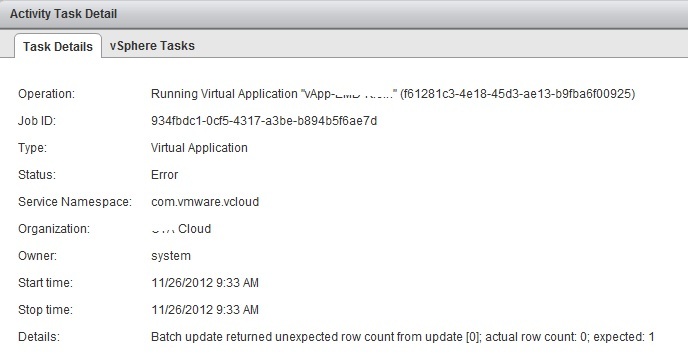 vCloud, vCloud Director, VMware admission control, batch update returned unexpected row, director, vcloud, VMware. permalink. 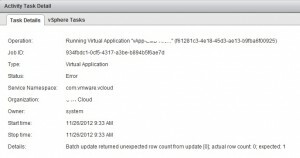 Don’t be a dumbass, check the VMware Compatibility Guides!